The Blue Springs Agriculture Science students have been working on planting flowers at Baumgardner Park. The class is a Landscape Design class, which is made up of Junior and Senior Ag Science/FFA members. Blue Springs, Mo. – The Blue Springs water tower located at 1100 SW Smith Street is currently undergoing cellular communications mounting upgrades and repainting resulting in the loss of 21 parking spaces. The primary parking lot at the Howard Brown Public Safety Building will be closed until the project is completed in September. Temporary parking will be available to visitors of the Blue Springs Public Safety and the Community and Youth Outreach Buildings, Municipal Court, Planning Commission, and City Council meetings on the east side of 11th Street. Handicap accessible parking will be available in the municipal parking lot at 200 SW 11th Street. Signs are posted at the entrance of the temporary lot for ease of identification. The parking lot is also used for the Farmers Market on Saturday mornings and Tuesday afternoons and will be unavailable for parking. Visitors will need to use on-street parking when the Farmers Market is in session. For more information, contact Chris Sandie, Assistant Director of Public Works at (816) 228-0195. BLUE SPRINGS, Mo. – The City of Blue Springs, Blue Springs Public Art Commission, Blue Springs School District and area businesses and veterans’ organizations have formed a partnership to bring the traveling exhibition of the Vietnam Veterans Memorial Wall to Pink Hill Park Thursday, Sept. 30 to Sunday, Oct. 3. The exhibit will be free to the public and includes a special welcome home to all Vietnam War veterans. ATK, which operates the Lake City Army Ammunition Plant adjacent to Blue Springs, has agreed to be a lead partner for the event. Mark Hissong, the vice president and general manager, will present a $15,000 check to Blue Springs Mayor Carson Ross on Tuesday, June 1, in a special ceremony at 1 p.m. to launch the major fund drive for other sponsorships. That event will be in front of Blue Springs City Hall, 903 W. Main Street. The funding for the Blue Springs “The Wall That Heals” is all by donations. All funds are set up with the Truman Heartland Community Foundation, a 501-C-3 organization. For more information, contact Kim Nakahodo, Communications Manager at (816) 655-0497, visit the Web site, www.bluespringswallthatheals.net or Wall That Heals Blue Springs on Facebook. BLUE SPRINGS, Mo. – Due to mechanical problems, the 50-meter outdoor pool at the Blue Springs Centennial Pool Plex, 2401 NW Ashton Drive, will be not be open this Memorial Day Weekend. The 25-yard indoor pool, outdoor wading pool and concession area will be open from 12:30-7 p.m. on Saturday, May 29, Sunday, May 30 and Monday, May 31. Lounge chairs will be added to the concession and grass area for those wanting sun exposure. For more information contact Steve Willman, Parks and Recreation Operations Manager at (816) 228-0237. The plant sale will be open during 5th, 6th, and 7th hours during school and until 4 p.m. after school every day until the greenhouse is emptied. Reservation Deadline is Friday, June 11. MORE: Individual players are $175. Funds raised will go towards the expansion and renovation of St. Mary's Surgical Services. Call Malinda Maddox at 816-655-5363 or email mmaddox@carondelet.com for reservations. Best Time to Purchase Your Summer Pool Pass is Now! Your Summer Centennial Pool Pass! You know that it is going to get hot this summer and the Centennial Pool-Plex will be the place to be for your leisure fun. By purchasing your pass before Memorial Day you will receive 5% off the purchase price. Purchase your family summer pass by Memorial Day and also receive two free single day guest passes to take friends to the pool. You will receive one free single day guest pass with each individual summer season pass purchased. 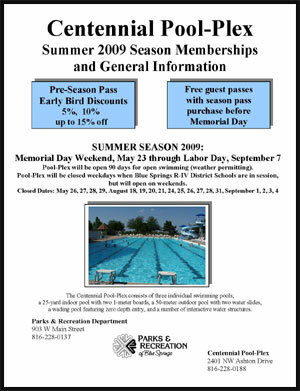 See the attached flyer to get more information on the Centennial Pool-Plex and how to save money purchasing your summer season pool passes. Tuesday May 18, 2010 marked the opening of the Mizzou Center in Blue Springs as a part of Missouri Innovation Park. When I began my term on the City Council in 2005, I quickly discovered I had a lot to learn about many diverse subjects. The Blue Springs Economic Development Corporation was just beginning to take shape, and one of the most challenging issues we faced at that time was how to improve the economic development environment in Blue Springs, effectively and efficiently. The city examined ways to shift the function of economic development from a city department into a public/private partnership that would engage the business community. Business and development leaders worked collaboratively with city staff and elected officials to focus on finding solutions to the issues that were holding back our city. As the EDC officially structured its organization, private businesses became investing partners by pledging financial support and leadership resources. Founding members included business leaders from all over the area. A complete listing of the current investors of the Blue Springs EDC is available at http://bit.ly/bsedcinvestors. Wanda and I discussed the opportunity of investing and decided to make a three-year commitment to the organization through our company, CPros. We have since renewed our investment for a second three-year commitment, in support of the EDC and recognition of the success it is achieving as our city restores the focus on positive development, and the quality of life in our city continues to improve. My business, CPros, is a local company, but over the years, I have learned that my business is not easy to understand. CPros was begun in 1987 by Glenn Beasley, providing custom computer programs for businesses. I joined Glenn in 1994, and our mission has always been to help businesses increase their profitability through computer automation. For example, if you take a music lesson or rent an instrument from Meyer Music, our software helps them manage that process. If Ryan Lawn & Tree takes care of your yard, our software creates the invoices you receive. CPros expanded about 10 years ago, adding computer network-support options for our customers. We maintain computers and networks for small- to medium-sized businesses, serving as an IT department. We also sell computers, including desktop systems and servers. Mayor Ross has appointed me to serve on the EDC board of directors, as a representative of the city. As a local public/private partnership, there is always the possibility of conflicts of interest when serving in such a capacity, and I feel it is important that I disclose my company’s affiliation with the EDC. CPros provides technical support and maintains the EDC’s computer network. I take my representation of the city very seriously and will recuse myself from any discussion or vote that might involve my company’s service to the EDC or any conflict that may arise from our business relationship. I appreciate the opportunity to represent our city in this capacity and for Mayor Ross for appointing me to serve on this board.